The Dominantly Inherited Alzheimer's Network (DIAN) observational study compared pathophysiological markers between mutation carriers and non-carriers in autosomal dominant Alzheimer's disease. This study revealed that changes in the biomarkers in the mutation carrier's brain start as early as 20 or even 25 years prior to the onset of symptoms. 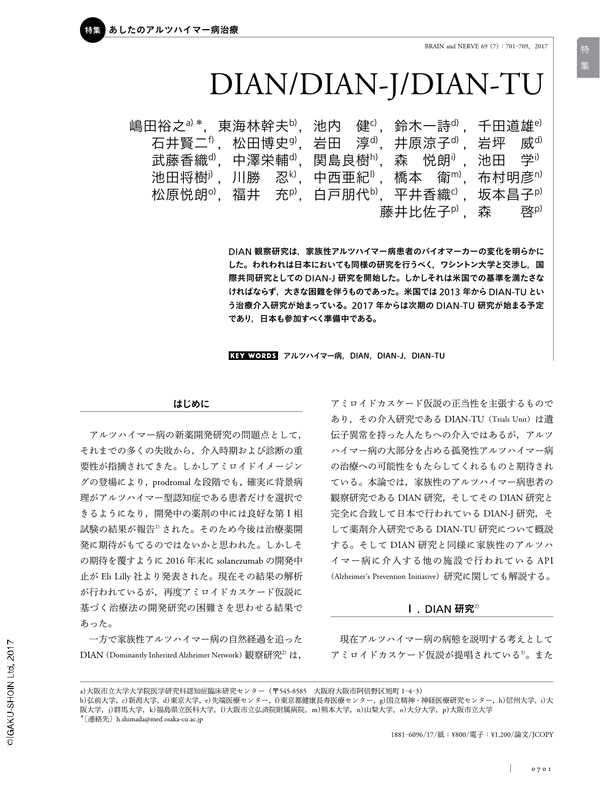 Doctors of the DIAN-Japan team have successfully implemented the DIAN study in Japan (DIAN-J) with effort and enthusiasm. The DIAN-J study is completely compatible with the DIAN study. All members of the DIAN-J team were certified by the NIH and Washington University. The DIAN researchers started a prevention trial (DIAN-TU) testing two monoclonal antibodies in 2013. Together with the DIAN global members including the Japanese team, they will start the new DIAN-TU NexGen Trial testing a BACE inhibitor in 2017. The API study is another clinical trial of anti-amyloid monoclonal antibody therapy for family members of patients with early-onset familial AD who carry the PSEN1 E280A mutation. This study has shown the same biomarker changes that were reported in the DIAN study. Copyright © 2017, Igaku-Shoin Ltd. All rights reserved.